Has your mobile phone become your most prized possession, always stuck to your ear it in your hand as you text, surf the net and check social media? Or perhaps you find yourself glued to a tablet or PC more often than not, sometimes so absorbed by the digital world, you forgot to stop and enjoy the world around you. If this sounds like you, this month’s simplify task is going to be tough… but beneficial! Do you remember the last time you took the time to disconnect from your devices? If the answer is no, you are probably getting a little nervous by now as to what this task may entail. You should be. We are going to turn your world upside down… but only sometimes. We all need to take time to disconnect from our media and technological devices. When we are spending endless hours every day absorbed by these devices, we are missing out on the world around us and the opportunity to just be in the moment for a while. Whether this be missing important moments with our kids because we are ‘working’ or failing to have a meaningful conversation with our partner as both of you are checking the latest on Facebook. It can cause our relationships to suffer if we don’t take time to disconnect sometimes. And besides, even the busiest person working the most crazy hectic job needs time to disconnect so it may be your job that is taking up so much of your time online, but no job is 24/7. 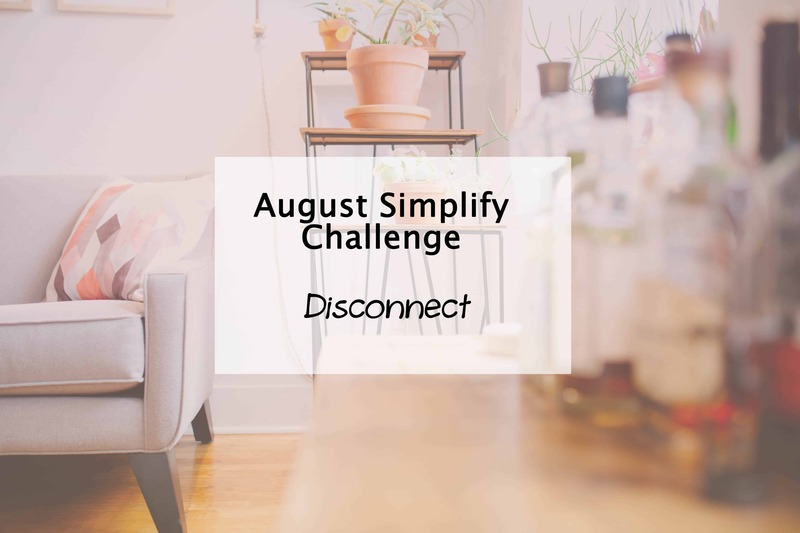 So for this month’s Simplify My Life task, I want you to take the time to disconnect for a while, whether it be between a certain time each day, or taking a full day on the weekend where only essential device use occurs. By making this change you are not only more engaged with those around you, living in the moment, but you are also less distracted and potentially stressed by the online world. Because lets face it, it isn’t all sunshine and roses on there. A bit of time away from other people’s drama is a great step towards simplifying your own life. So once you read this, and of course leave a comment to share your thoughts below, maybe disconnect from your devices, turn off your electronics and go do something super fun that doesn’t require electricity for a while. Do you take time to disconnect regularly? This is great (and something Im actually focusing on at the moment!). My big thing is emails – I always have them on and checking/replying. I’m trying a new thing where I only check them twice a day and reply or archive straight away. It’s kind of killing me, but I’m finding that I’m wasting far less time! I’m pretty good at this because I don’t have a smartphone but the laptop is on the breakfast bar in the middle of the kitchen so I probably check in far too often that way! I do disconnect but no where near as regularly as I should. :/ Thanks for the reminder. I am on a screen for a good portion of the day, but I never feel like it’s too much. I’m pretty productive when I’m on it, and I’m doing things that need to be done. I also can quite happily not check in on social media so I feel like I’m balanced. Time away would actually stress me, because I couldn’t keep my to do list balanced. I accidentally left my phone at home last night when I went out, and I lived. I didn’t die without it and I wasn’t constantly checking random things like instagram or facebook. I actually spoke to people. Was a bit of an eye opener.